Lufthansa is an excellent airline in so many ways, but misses the mark when it comes to longhaul business class. While there was nothing glaringly wrong with my 11-hour flight from Frankfurt to Los Angeles, there was also nothing that made it special and several things that made it below-average. As I said after writing my first reflections of this flight, please keep this review in context. The product is like night and day compared to economy class or even premium economy class. But Lufthansa business class is not a top-tier product by any definition of the word. I was among the last to board, finding my seat upstairs in a cabin that departed with only one open seat. I had not been on a 747 since United’s final 747 flight last autumn, so this was quite a treat. I love the windows to the right of the stairs to the upper deck, a unique feature of the Boeing 747-8. I chose row 81, the front row of business class, because the foot cutout is slightly larger. The upper deck features eight rows of 2-2 fully lie-flat seat seating. While sufficient for both lounging and rest, the seats are not the most comfortable. The glaring issue is the footrest, in which your feet are just inches from your neighbors and separated only by a thin divider. Inside the armrest is the tray table, IFE hand-held remote, and headphones. I appreciated the side storage compartments. Waiting at my seat was a mattress pad, blanket, and pillow. The blanket is plush and keeps you very warm. Unfortunately, the cabin became so hot upstairs that I could not sleep…quite a difference from ice-cold cabin from Los Angeles to Munich earlier this year. There are no individual air vents on Lufthansa’s 747-8. The seats are fully-flat when fully-reclined. Service was the most disappointing aspect of the flight. The ladies working upstairs were pleasant, but either very recent hires or just having an off day. Lufthansa does not use trays in business class. Prior to meal service, a FA floated a tablecloth to me…it landed halfway on, halfway off the tray. Moments later, she handed me a bread dish, butter dish, napkin with cutlery inside, and salt & pepper shaker. Service protocols calls for a FA to step in and arrange it on the tray table. It’s not that I could not do it myself. Rather, it struck me as odd an unprofessional that this was handed to me without any explanation. Furthermore, the tablecloth was stained. Attention to detail is vital. Throughout the meal service, empty plates were not collected nor were glasses refilled. I was not offered wine during dinner, nor was the Miles & More HON member sitting next to me. With the exception of a brief appearance during the German World Cup match to offer snacks, FAs disappeared until the pre-arrival service 90-mintues prior to landing. 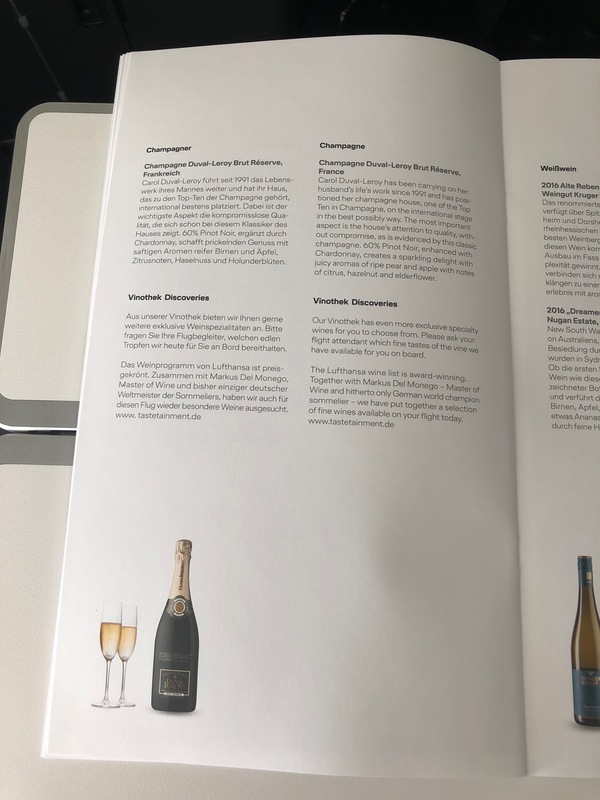 FAs did offer a choice of water, orange juice, or sparkling wine prior to takeoff. Unlike on United, I like that Lufthansa uses real glasses for pre-dearpture beverages. Service began about 30 minutes out of Frankfurt with a hot towel. That was followed by a ramekin of almonds, served room temperature, with a choice of beverage. I just had sparkling water. I chose the goat cheese appetizer, which included mushrooms and bell peppers. It was quite nice. I was disappointed there was no Laugenbrötchen (pretzel bread) available, but pretzel rolls would appear for the pre-arrival meal. When I had finished, the FA appeared to clear away my plate. I requested a salad and an embarrassed look spread over her face…she was supposed to have offered this prior to the main course. I don’t mind eating a green salad after my main course as a palate cleanser, but this represented another service slip-up. Other passengers were also offered salads and accepted. The choices for dessert were fresh fruit, cheese, or ice cream. I asked if I could try all three and was obliged. Lufthansa has no cappuccino in business class, but I did have an espresso. During the Germany vs. Sweden World Cup match, a light snack was offered of fruit, olives, and cheese. In the rear galley, additional self-serve snacks including potato chips, chocolate, and almonds were offered. Also available: special World Cup lollipops. About eight hours into the flight I was hungry and did enjoy the snacks. Finally, a light meal was offered two hours prior to landing. This included beef goulash (served lukewarm), salad, bread, and a small piece of cake. But the kit doubled as a grocery/shopping bag. In California, single-use plastic bags at grocery stores are banned. Now I have a grocery bag with the Lufthansa logo on it…I like it! Upstairs features a forward and rear lavatory. These are small, but there is a still a bit of room to move around. Amenities include Korres hand soap as well as shaving kits, combs, and mouthwash. Midway through the flight I took a walk downstairs. There is still something so special about this aircraft. I’m glad Lufthansa bought the 748-8 and hope it remains in the fleet for years to come. So German! I love it. Although the aircraft is provisioned for in-flight calling and wi-fi, the system was down for most of the flight. It briefly flashed on about two hours prior to arrival, but even then I was unable to connect the internet. Since rest was also elusive on this flight, I watched a couple movies in addition to the World Cup game. One was a comedy called Spy featuring Melissa McCarthy (hilarious) and the other was the true story of Molly Bloom called Molly’s Game. I recommend both films. The IFE selection includes about 100 movies and also features TV shows, live TV, games, and music. Lufthansa uses Bose noise-cancelling headphones in business class which worked quite well. We landed on-time in Los Angeles. 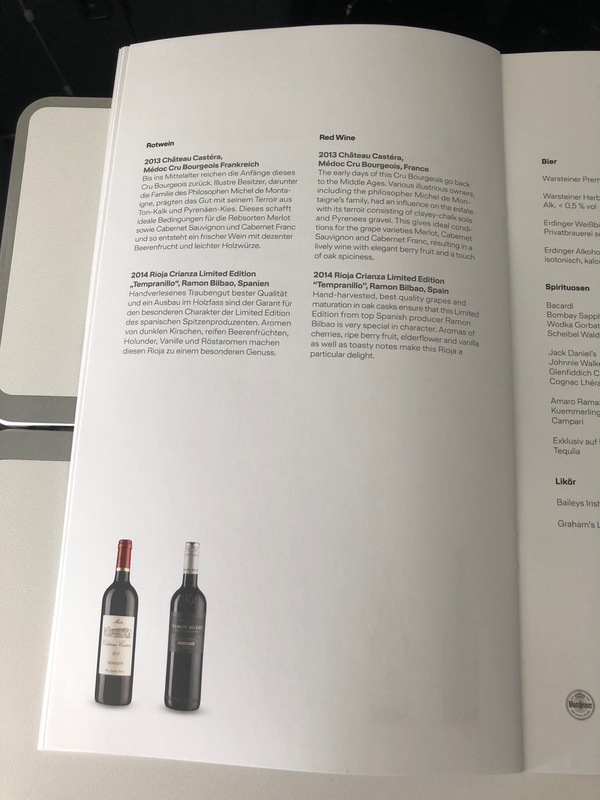 While the service was disappointing and seat not all that comfortable, I want to again stress that Lufthansa Business Class remains a perfectly reasonable product. But is it the best? Not even close. I’d rate it below average. Matthew, which one would you choose between LH Business and BA Business? Is LH fully flat? I would take LH because I don’t like LHR. Both have lie-flat seats. Both are below-average. Go for Lufthansa First…you won’t regret it. Both are fully flat, neither has direct aisle access at every seat. BA is even denser (less space per seat) in business class, so I’d go with LH. while denser, BA’s seat at least offers some sort of privacy. That’s something the LH seat lacks a lot! BA vs LH J is a tough one lol I’d go for BA J just for the privacy aspect. Matthew – who do you think is best for west coast US to Europe? I always fly LH to try and upgrade to F using my SWU’s, but on those trips where I can’t, I’m often torn for my choice. I’ve also done LX, but was underimpressed there, too. Note I am missing Air France and American, which I need to review soon. I’d be so curious to hear your opinion on Air France. I live in LA also, and have flown AF to Paris 6 or 7 times in business, PE, and economy over the past few years. Obviously you know to stay far away from the A380 flight if in business. I love their hard and soft product in all the cabins I’ve flown (waiting for a reasonable La Premiere paid fare to try that out). Also, they’ve always been very good about upgrading at check in if there are seats available. All it takes is a phone call. Depending on how much you already paid for your ticket, the upgrade cost can be reasonable ($3XX from economy to PE… $6XX from economy to business I think). Interesting, thanks. I’ve been tempted to try SK, but have been put off by their intra-Europe service. Since I’m never traveling just to CPH, that’s been a gating factor. I flew Seattle to Frankfurt back in December, there was salad on the menu but it was never offered. It didn’t occur to me that we had missed it until we landed, but I did think it was odd. Could not agree more, based on some recent long-haul flights in LH business. The positioning of the footwells and associated angling of the seats is simply bizarre. Even for two people traveling together who don’t mind the “intimacy”, it’s uncomfortable and awkward. As for the service, I had one truly outstanding flight attendant who knelt in the aisle and made eye contact while taking orders, and also made personal conversation because he wanted to know the etymology of my last name. All of the others were passable to sub-par, and I experienced comparable service lapses such as not distributing menus, not clearing plates, and not “monitoring” to see if anyone needed a glass refilled, etc. No one was outright rude or indifferent, it was more a kind of genial incompetence. On the plus side, the plane was immaculate, and as you noted nothing really beats the upper deck on the 747 which is hands down my favorite place to sit on a wide body plane. I’m so glad those photos fooled you. I love pristine cabins shots before the flight. Sadly, I boarded late on this one and had to wait till the end to get my pictures. These were taken after landing at LAX. 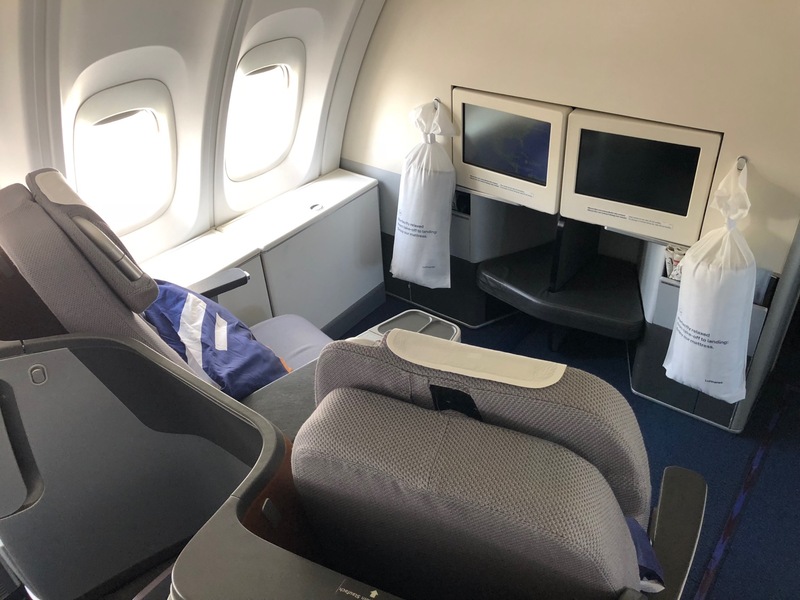 Those cabin pictures annoy me so much because the headrest are messed up, there are discarded mattress pads and pillows, and it is generally untidy. As Drew said above, I must give Lufthansa credit for always having a very clean cabin. Couldn’t agree more with the review. All the bedding is nice but if you are on the aisle (my preference) there is no storage! I sat in the same row a few weeks ago and vowed to avoid it flying solo at all costs. I’ll actively look for United seats ahead of it (unless it’s the 2-4-2 config). Why don’t they have a privacy divider? Quite similar to klm”s upstairs 747 but id much prefer their cabin for some reason. I felt so uncomfortable next to my seatmate (who was a very nice passenger). Finally saw availability in first on lifemiles and swapped in straight away for Flight from Bilbao back to Chicago next week. On a side note I have a 45 min connection at FRA arriving from Bilbao. In the last 2 months the arriving plane has been late 50% of the time! As it’s the last flight of the day should I press for any certain hotel if I can’t make the Ord Flight? Doesn’t seem like this Flight makes up time in the air like my WAW- FRA Flight last month (where I had a 50 min connection and made it by sprinting to the gate). There’s a new Hyatt Place at the airport I’ve been meaning to try, but the Hilton is better than the Sheraton or Hilton Garden Inn. If you’re up for a 20-minute train ride, head down to the Hyatt Mainz. Thanks Matthew – legend! I did enjoy your review of the Hyatt Mainz last week! If that is people’s biggest issue, and if they are willing to sacrifice the extra storage from the window seats upstairs, then seats D and G in the main deck are definitely recommended. They’re a bit further apart, so your feet/legs aren’t quite as close as the A, C, H, and K seats in the main deck or the seats in the upper deck. Plus, full aisle access for both people in the D & G seats. A very fair review. I liked how you were able to note the failures without falling into the “this is worse than economy” trap another blog leaped into a while back. I have found LH’s business class seat to be just fine, and better than BA’s, while the LH food is better than UA or BA. Though I have not experienced the service lapse that you did. UA has the best seats, but I find their food to be less than mediocre. I also like AF both for service and food. I usually purchase the most discounted or upgradeable business class, though, and most times these days that is UA. Where would you put LOT Polish in the list of choices from US to Europe? Business class, Economy Premium, and regular Economy. Maybe I missed sonething….Is there NO storage at the non-window seats? Where does one put the Bose, eyeglasses, iPad, etc. when sleeping? There are smaller storage compartments within the seat, but storage space is very limited. I live in Frankfurt and regularly fly LH. I have to agree that while their business class is world’s away from Economy, it’s just “meh”. I hate the 2-2-2 configuration and find it somewhat insulting to climb over someone or be climbed over while in Business class. I find the LH food bizarre and usually unappealing. The service is inconsistent. I also have noticed there is no attention to plate clearing, drink refills, etc. I almost always have to ring the bell to get my tray cleared and to get more water. I drink a lot of water on the flights and they always give such tiny glasses and look at me like I’m crazy for wanting more than two sips of any liquid. I tend to prefer UA or Singapore for long haul to the US (as long as I can avoid UA’s awful 2-4-2 configuration). I’m flying Qantas and Qatar airlines soon – any thoughts on either? I regularly fly LH making several overseas flights during the year from Italy to US mainly for business purposes always flying BC. 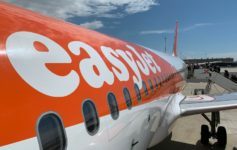 Besides the fact that nothing really makes the international flight special, their flights and services have started a deep decline already a few years ago but now seem to have aligned almost to low cost airlines. Obviously not their fares which are comparable to the best airlines though. 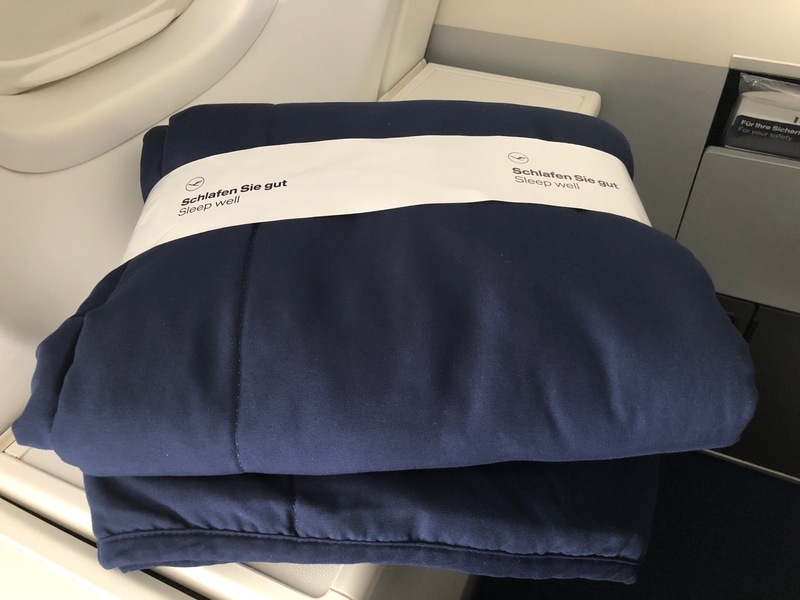 Last Jan 2019 I flew from San Francisco to Munich (FLIGHT LH 0459 JAN 15 2019 – SEAT 24G) in BC but my seat was not reclining neither the backrest nor the legrest. I called the flight attendant but nothing happened so I had to fly the entire 11 hours on a regular economy class seat instead of enjoying my expensive business class seat. I sent a claim to their customer service area but even though they admitted I had was “rightly expecting a comfortable seat with variable sitting and sleeping positions”, the only thing they answered is that they were sorry but they “cannot turn back the clock” and they would refund me with 10000 miles. This answer was also in reply to another mistake made by Lufthansa miles&more service since they booked me the flight I asked but on a different day and they refused to correct and change my date unless I paid 50€ penalty per each passengers (X3). I even raised the question to the upper level but they confirmed the position written by their initial clerk. I think that if this is the level of service they mean to provide to their loyal customers, they better lower their rates to low cost airilines ones. I have been flying for about 20+ years to Europe in First Class and Business. My flights last July on Lufthansa from LAX to Frankfurt and then back again to LAX were about the most awful I have ever experienced. Without outlining the awful service on all levels, even at the airport in Frankfurt, there was not a trace of customer care! Only the luggage folks from the airline showed any concerns after my luggage never arrived in Milan. It took almost 2 days to recover it. In all of this, I never meant more uncooperative people. The crew on the rerun flight to LAX were rude, uncaring and bit very interested in anyone. Two folks across from me were just startled at eh attitudes. Lufthansa has fallen on hard times. I would never recommend anyone flying this airline!! I’m sorry you had a bad experience on Lufthansa!